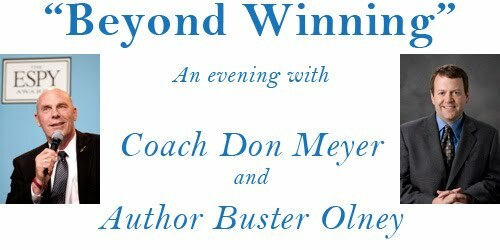 YouthReach International invites you to join us at a benefit dinner affirming the timeless values of Coach Don Meyer, with special guest ESPN's Buster Olney, author of How Lucky You Can Be: The Story of Coach Don Meyer. 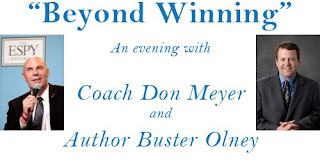 Coach Don Meyer has influenced thousands of men and women in his basketball coaching career, guiding them not only in their skills on the court as a team, but also as productive members of society, thinking of others first, and joining together to become part of something bigger than themselves. In speaking of his program, Coach Meyer has been quoted, "Your program must have an overriding purpose which is clearly visible and which teaches lessons beyond winning." This philosophy of life has impacted organizations, relationships, and families around the world. Coach Meyer's coaching philosophies have influenced the staff and Board of YouthReach International, and as a result are now being shared with Mentors and orphans throughout Ukraine and Russia. This benefit dinner is an opportunity to share with friends, teams, customers, employees, and families the wisdom of this legendary coach. We will share a meal together, briefly hear about YouthReach International's orphan mentoring programs, and then Buster Olney will introduce Coach Don Meyer. A book signing opportunity will conclude the program. Contact me via this blog or at my profile email address for more information!